Miss Caroline Vernon by François-Xavier Vispré (c.1730 – London 1790). pastel on paper. ©National Trust Images/John Hammond. I troll the interwebs in the fishing and not the under-the-bridge sense: there’s a lot to read out there. Still, I’ve kept one eye on the feather-and-flower kerfluffle that erupted in certain circles this week, but have been much more interested in documentation of one kind and another. Miss Vernon is really my favorite image of feathers on hats, and I wish I could say that a) I have replicated this fabulous creation or b) that I have seen such a thing, but alas! I have not. Still, scouring sundry repositories for tayloring manuals (more on that another time), I found this delightful broadside. 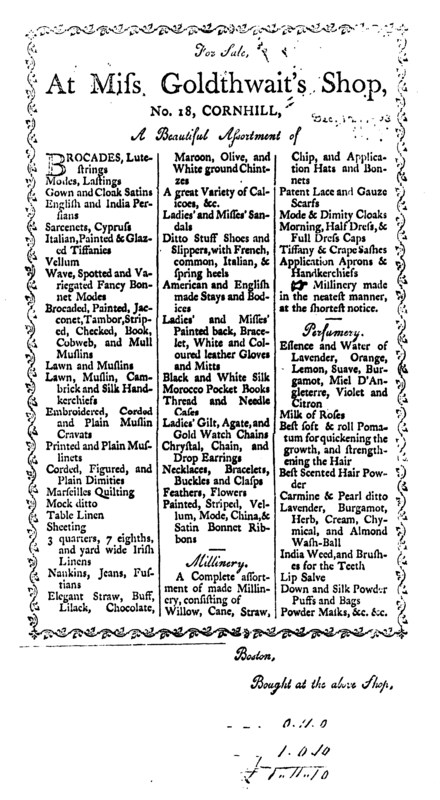 We can’t use 1782 to document 1780, and no means of using any of these items is mentioned or implied. Still, there they are, those inflammatory terms: Feathers, Flowers. To paraphrase Max, Let the wild rumpus continue. Feathers and flowers were being sold maybe, but where were they being worn? In big hair for evening, or on hats? Also 1782, as you rightly observe, does not document 1780. The short miniskirt I barely (heh) got away with in 1967 would have gotten me ejected from nice places, if not arrested, if I had worn it in 1965. The kerfuffle of which you speak seems to me to be causing a rumpus far beyond its significance. I don’t quite fathom why folks care so much about the clothing regs for this one event. I suspect that the flowers and feathers are being sold for Big Hair, in part because they’re not listed in millinery, and in part because there seem to be more images of women with flowers in their hair than on their hats. Two years is a long time in fashion years! Dress codes at my high school got stricter the year after I graduated (correlation is not causation) but the difference in skirt length and leg apparel would be notable if one were studying images of that small society. And it could be hard to read images correctly without context. What’s normal in Providence stands out a lot in small town New York State. Context is key. The rumpus seems out of scale to me for an afternoon. I have one gown post-1775 and pre-1795. My choices are to wear that gown, dress 5 or so years out of date, or skip the event. I can live with any one of those options. Sartorially, I’m the same boat (so to speak). I have two dresses which would be five years too forward (c. 1785) and a bunch which are a bit too early (c. 1770 or so). OTOH, if we are all in the same dilemma, maybe that’s a good reason for the event organizers to insist we all pay more attention to what c. 1780 would have actually looked like.